3. I finished what will be the last round of an RR for me. This is Christine‘s RR. The three other ladies in this group still have one more round, but as Renee is only stitching for us, there was a free slot in the rotation. It actually worked out well for me as I don’t have an RR obligation for the rest of the year. 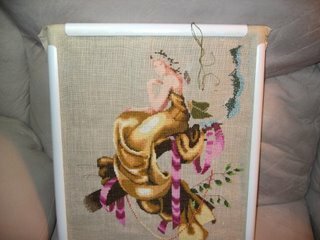 I plan on using that stitching time for a few Christmas gifts. I guess I need to get stitching. Here is the winter heart I did for Christine’s piece. I used an entire skein of DMC 519. These hearts are charted for full color, but Christine requested that we pick a single color that we felt represented the season. I like the blue glare you see off snow in the winter…hence I picked a nice blue. You’ve been stitching up a storm Leslie! I can see you will be having 2 big HD before too long. Gorgeous projects. 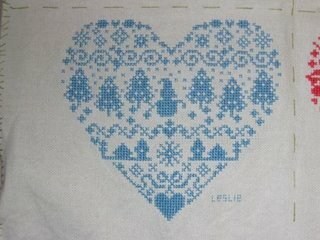 I particularly like the blue that you chose for the winter heart. Your fairy is looking good. I love that blue heart you did. That RR piece is going to be so pretty! Hang in there with white wedding! if anne can stick in there with her dratteds, then you can finish this one! If I were a stitching cheerleader I’d be waving my pom poms at you! GO LESLIE!!!! YOU CAN DO IT!!! Oh my gosh! Woodland Fairy is almost there now! Congratulations!!! 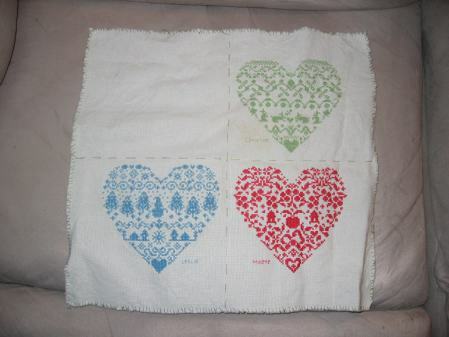 Woodland Fairy looks beautiful and I love the heart you stitched for your friend’s RR. Wow… Woodland Fairy is gorgeous!! Love the RR piece too. all wonderful stitching there Leslie, I can see you’ll have the Woodland Fairy done in no time at all 🙂 hope you have a good week! Fantastic progress, Leslie! Your fairie looks so fantastic & white wedding is awesome. I can’t wait to have my RR home – what a pretty colour you chose!